Little of consequence happens in this episode – but it is harrowing. In a studio apartment, in another flophouse, Franz binges on beer. Drunk night and day, he will at times take stock of the other tenants. And from his window he may watch some of the folks on the street below, or in the building across the way – but he boxes himself in. Generally, he leaves the room only to exchange empty cases of beer for full ones downstairs. Evidently he wants to glug himself to death. Enter Baumann, the nosy next-door neighbor. Baumann looks like Abe Lincoln. He wears the one same robe, and he’s always around, cleaning things. Offering good will. Baumann, it turns out, is no stranger to death, decay, suffering. He was a medical orderly in the war. See how, in a long take, he cleans the mess that Franz made the night before: Scum, vomit and bottles crowd the floor, but Baumann only uses a washrag to…clean the edges of a puddle of puke. Something’s not right about this man. Unfazed (period), he is keenly aware of the comings and goings at the flophouse. He and Franz take to calling each other, respectively, Satan and Job – and when Franz’s growing interest in the illicit activities of his neighbors begets a thirst for sobriety, Baumann lays his cards on the table: If I heal you, what’ll I get in return? In the midst of this friendly biblical repartee, Fassbinder breaks from the claustrophobic action (or non-action) to show us the God over which these men banter, a naked bearded God who loves his little lambs but slits their throats just the same. The shot is uninterrupted. The slaughter is f*cking REAL. Did Fassbinder really have to show this? Does the force of the point made (that love and death are blind, and any sensible grasp of the chaotic world necessarily conflates God with Satan; that a lifeline thrown to the man in need of help can be a hell, anyway)…does that justify the actual onscreen death of an animal? In the director’s mind (God’s mind) — yes. In order for the lamb’s death (and all it symbolizes) to be honest and true, we need face the shock of it, the pitilessness. In Fassbinder’s Berlin Alexanderplatz, the plain fact of these things must stand as such. As pure. And so, with the ticking of the clocks and the buzz of the streets (I love the ambient noise patched in), Franz sobers up. “A Handful of People in the Depths of Silence” is a tough episode to watch. It reminded me, in parts, of French Connection II, where an imprisoned Gene Hackman is injected with H then, later, kicks the drug cold turkey. Guilted for events that occurred in the previous episode, Franz numbs on, to better handle the wreckage. No-one, not Lina, not Meck, not even his landlady, knows where he is, and he likes that. Eva, a fling from the past, does find him, but he insists: By himself he must win the battle with himself. 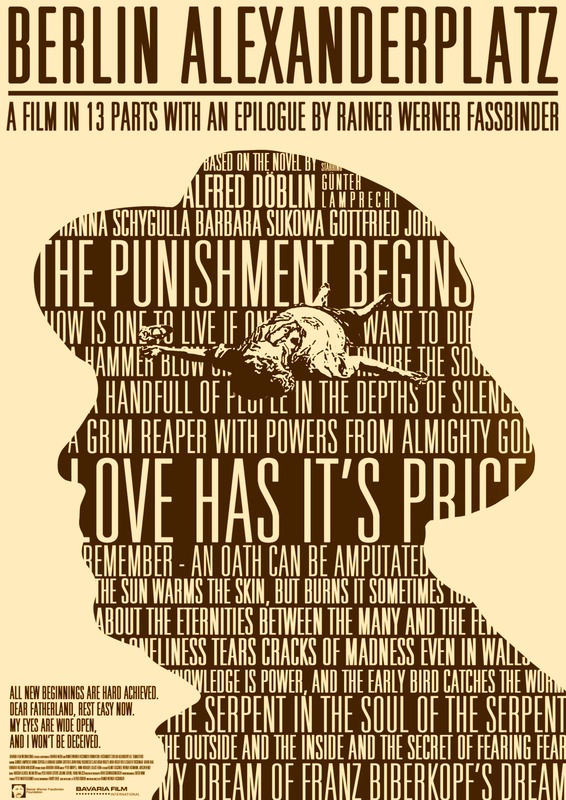 In terms of its themes, messages and characters, or even the slow steady manner by which Fassbinder continues the story of Franz Bieberkopf, this episode says nothing new. There is, at its end, a crinkled return to the end of the first episode: Franz, having survived the last battle, will live to fight another day. He will, we sense, attempt to redeem himself for once and all. But will he succeed? Can he? 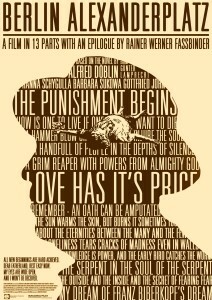 Fassbinder has already answered that question.